Hello Wingman. Welcome to the power crystal sector. This mission is easy. 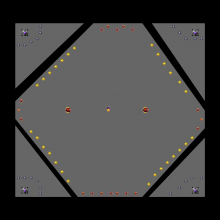 Just collect the crystals and defeat the few enemies in the sector. And don't mind those bases that are blocked off. Security's been tighter as of late. Some purple flying monster thing has been taking out our forces. Nothing you need to worry about. Go get them!